The purple gloves are off, the legend has entered the ring, and she is ready to deliver a 1-2 punch combo on mind and body. 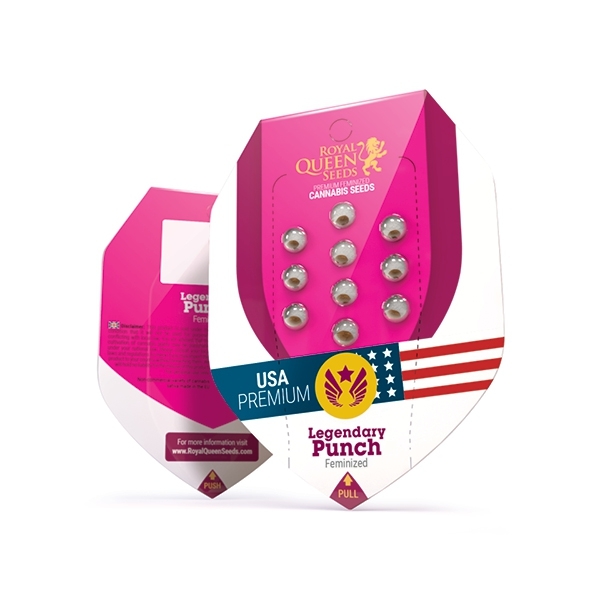 With three incredible strains in her corner, Legendary Punch is a knockout sensation for hybrid lovers. Flooring cannabis connoisseurs, she will leave you in a couch-locked state of bliss. Pre-roll your joints, turn off your phone, and prepare for a TKO. An elegant central cola shows off her swagger and confidence. Hues of green, orange, and purple are worn like a pre-match gown. Her aroma is just as brash to begin with, hitting growers as soon as they come close. Fruity notes with hints of pine and citrus easily overwhelm the nostrils. Outdoor growers can expect to harvest at the beginning of October. Indoors flowering takes only 60–65 days, a small price to pay for her knockout attributes.